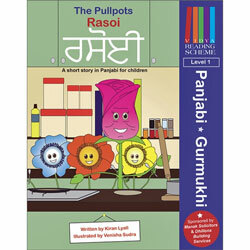 Children will enjoy learning to speak Panjabi with this bright, colourful and easy to follow book. Have Fun with Panjabi - Book 1 is based on a simple ‘say what you see’ concept, using English transliterations (phonetics). The same sounds that are used in English are used to pronounce the Panjabi words shown in the book. There is also a chapter testing what the child has learned enabling them to say short describing sentences. As with any language pronunciation is key, hence the ‘Have Fun With – ‘ series encourages parents to be involved in the learning. Have Fun with Panjabi - Book 1 is intended for children learning Panjabi as an additional language. Although Roman alphabet / English transliterations are used throughout, this title is best suited for use by children where they are able to have help from a native Panjabi speaker to check their pronunciation. I think this book is a great learning tool, it's really good how the book builds up on what is covered in the earlier part of the book. My 4 month son is fascinated the pictures.